Train as a team, succeed as a team! We offer an exciting variety of group fitness classes that will allow you to have a guided, trainer led workout with other individuals helping each other to push past their limits to succeed as a team! Are you the kind of person who wakes up every morning with a purpose and ready to hit the ground running? Try out our early morning FIT classes Monday through Friday. 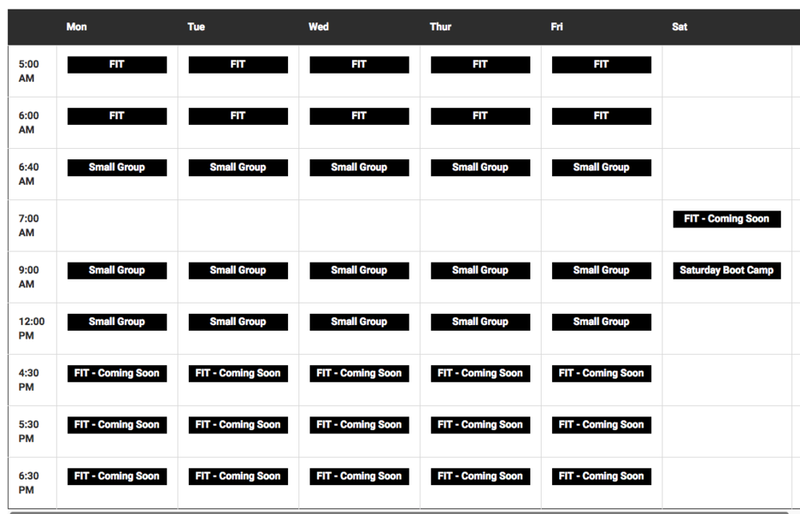 FIT classes are high intensity interval training based group workouts that push you to get results. Classes are never the same, constantly varied, functional and intense. Don't settle for cookie cutter, un-imaginative workouts from a globo gym or overpriced box. Expect more from your workouts and get results! Take advantage of our Saturday Boot Camp schedule and get variety in your workouts! Belong to another gym but want something creative for your weekends? Try out a free Saturday class and join us outside for fun, effective workouts guaranteed to kick off your weekend on a high note!